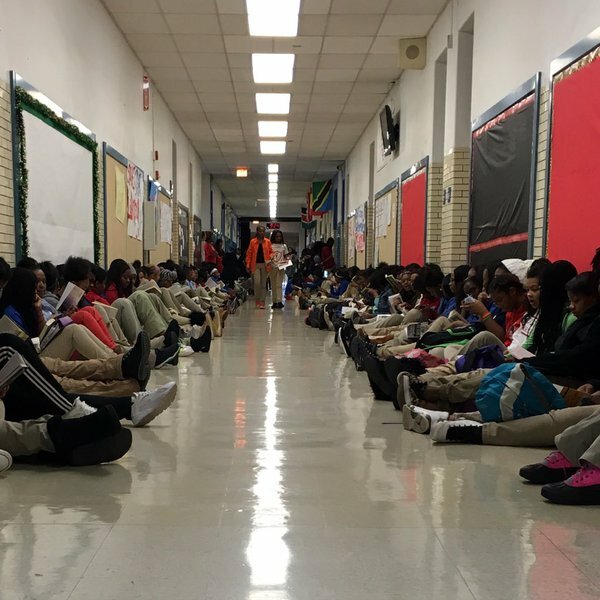 Hundreds of DuSable Campus students participate in the Dec. 11 read-in. Score another win for student activists in Chicago Public Schools, who last week helped to avert the dismissal of their beloved librarian due to budget cuts. Sara Sayigh, librarian at the South Side’s DuSable Campus, had been slated to lose her job at the end of this month but was saved by an anonymous donation that came through after students raised awareness through a read-in, an online petition, and the social media hashtag #SaveOurLibrary. The closure of school libraries and loss of professional librarians is sadly nothing new in Chicago and other financially strapped districts around the country. When we covered the story over a year ago, fewer than half of the 600 CPS schools had a full or part-time librarian. Since then the numbers have only gotten worse, and they’re particularly dismal in schools with a large percentage of minority students. Out of 46 high schools with a majority African American student body, only three, including DuSable, have a librarian. As we mentioned last year, school librarians are also front-line defenders against censorship, which seems to be a particularly vital role in CPS. When district administrators attempted to ban Marjane Satrapi’s Persepolis from all schools in March 2013, it was librarians who initially raised the alarm, invoked a district policy protecting library books (but not classroom copies) from arbitrary censorship, and helped teachers to recatalog classroom copies as library copies so they would not have to be removed. Student activists were also key in bringing national attention to that story, later receiving the Illinois Library Association’s Intellectual Freedom Award for 2013. Sadly the students at Lane Tech College Prep High School, the locus of that protest, also no longer have a librarian at their school.